The most common complaint that office workers have in relation to their physical health is lower back pain. Below is an outline of the lower back issues that poor office ergonomics can cause, and also some ideas on how to prevent ergonomic back injuries. There are two main groups of back issues that can be attributed to poor office ergonomics. The first are those issues that can be traced back to actually being caused by prolonged sitting or poor office ergonomics. 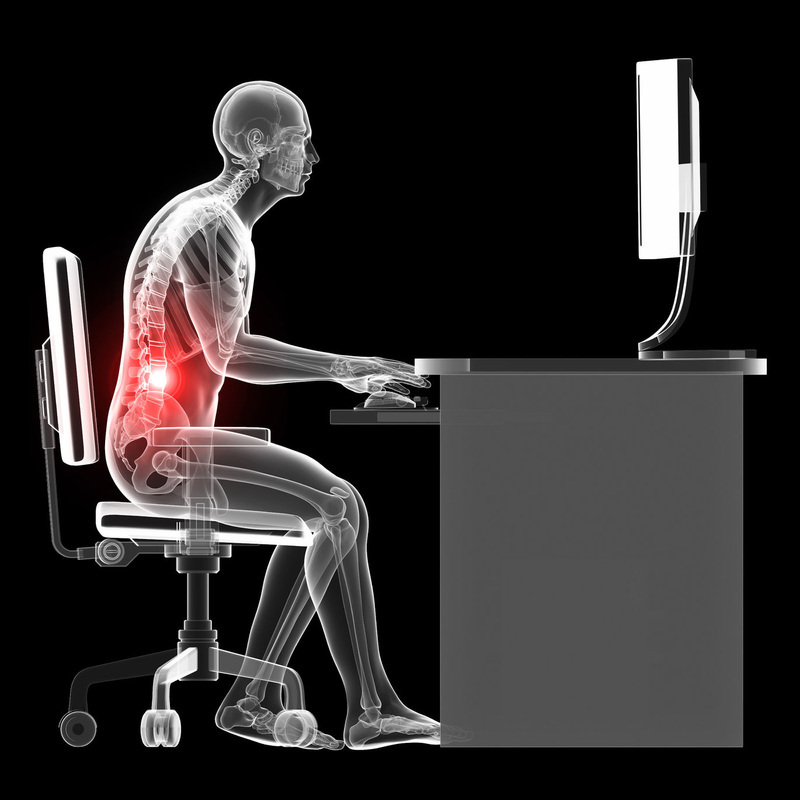 In other words, the mechanism of injury was the seated posture or the poor office ergonomics. The second are the issues whereby poor office ergonomics were not the initial cause of the injury or pain, but they are making the injury worse or inhibiting recovery. The most common back issue in office workers is a general non-specific back ache. This is caused by poor posture when sitting, and then exacerbated by prolonged periods in this poor posture. It is called a non-specific back ache because it is non-specific in the sense that there isn't one particular part of the lower back (i.e. disk, ligaments, joints, muscles) that is causing the symptoms. Instead, the pain is probably coming from a combination of areas that are all being stressed by the problematic posture. Slumped or slouched posture - whereby you sit towards the front of the chair, slide forwards, and slouch into the backrest. This results in your lower back not being supported by the lower back support that most chairs have. Frequent or prolonged forward leaning - when you lean forwards, gravity wants to pull you further forwards. To resist this pull from gravity, you have to constantly activate your lower back muscles to hold you upright. Over time, these muscles fatigue, leading to discomfort or pain. ​More specific back injuries are also possible from poor office ergonomics. However, it is not possible to say what these injuries are likely to be because it will depend entirely on what movement or activity you do. Just as important as back injuries actually caused by poor office ergonomics, are the injuries that occur outside of work, but are made worse by poor office ergonomics. Prolonged sitting is the key here. When you sit, all of the weight from your upper body is transferred from your lumbar spine into your pelvis. If you have a lower back injury, or are suffering from lower back pain, constantly loading up the lumbar spine through sitting may make your injury worse, or slow down your recovery. With this in mind, being able to switch between sitting and standing is a great option for those with lower back pain. See the pages "Standing Desks" and "Sit to Stand Progression" for more info on this. However, if a standing option is available, that is not the end of the world. It just means that setting up your workstation ergonomically is all the more important. Something else to consider for those with pre-existing back problems, is that prolonged sitting results in a reconditioning of the core muscles. This means your lower back is less supported and more susceptible to injury. The majority of ergonomic back injuries are caused by the accumulation of small stresses. Over time, these stresses accumulate into larger stresses, until the body is unable to recover at the same rate that the stresses accumulate. This then leads to an injury developing. With this in mind, the number one way to prevent ergonomic back injuries from occurring is to avoid prolonged sitting. If you have a standing desk available, that is great. Switch between sitting and standing regularly throughout the day. If you don't have a standing desk available, you need to make sure your workstation is set up ergonomically! Instead of emailing or calling colleagues, walk to their office. Drink lots of water so you have to go to the bathroom more often. Habitually work off a 25/5 principle. This means you work hard for 25 minutes, with no distractions, with your focus entirely on the task at hand. Then have a 5 minute break whereby you physically get up from your desk and move around. Have some exercise posters stuck up around your desk or the office to remind you to get up regularly and do some of the stretches.